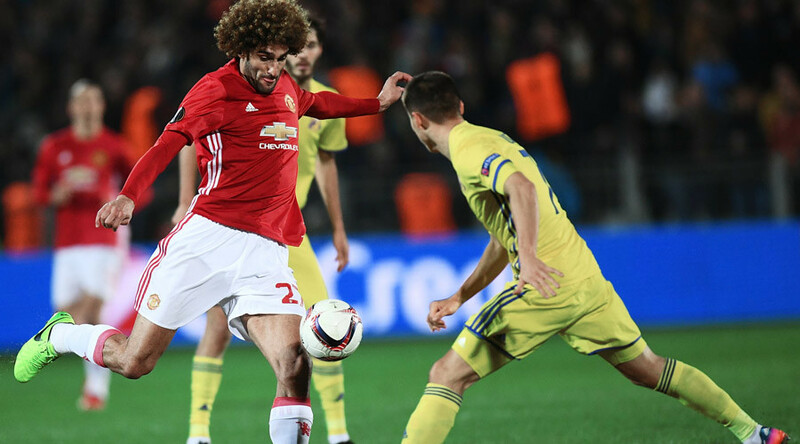 The Europa League last 16 first leg match between FC Rostov and English side Manchester United has ended all square at 1-1 after a fiery game in South Russia. Manchester United came away from their Europa League round of 16 1st leg tie against FC Rostov with a vital away goal in a 1-1 draw, courtesy of Armenian sensation Henrikh Mkhitaryan. 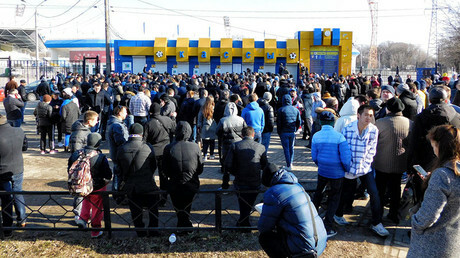 Warmer-than-usual southern Russian temperatures greeted the traveling fans from Manchester, who came to Rostov-on-Don for the Thursday evening game. Only around 250 away fans attended the game, and less than 100 of those are believed to have traveled from the UK, the rest being made up by United fans from different countries, including some former Soviet states. The pitch at Rostov's Olymp-2 stadium was something of a talking point before the game, as United manager Jose Mourinho said it was good for nothing more than a game of cricket due to its hard surface. The pitch suffered from the 3-month Russian Premier League break, from which it has just emerged. Nevertheless, the game started off in fiery fashion, with Rostov looking to claim another European victory at their home ground, where they have already beaten Bayern Munich and Ajax this season. Despite the best efforts from the hosts, it was United who went ahead on 35 minutes when Marouane Fellaini brought the ball under control and played through Zlatan Ibrahimovic. The Swede made it to the byline and squared the ball for Mkhitaryan to slot home from close range. United looked comfortable after the goal, and went into the break with a 1-0 lead away from home to protect in the second half. Undeterred by going a goal down and with the match still evenly balanced, Rostov came out in the second half eager to claw themselves back into the game. Their breakthrough came on 53 minutes, when Timofei Kalachev played a wondrous ball through to Aleksandr Bukharov in the United area. The Rostov No. 11 brought the ball down brilliantly on his chest before volleying the ball past United keeper Sergio Romero to level the score with the class that showed why he scored three goals in the Champions League group stages earlier in the season. Rostov were buoyed by the equalizing goal and pushed for another to lead the first leg, so as to go to Old Trafford ahead in a week's time. In the final minutes of the game, Rostov had numerous chances to go ahead, with captain Gatskan going close to adding a second, but Romero was equal to his long shot. Rostov still put United under pressure until the final seconds. On 90 minutes, Rostov won a corner, much to the delight of their expectant fans, but their weak cross was cleared easily. In the three minutes of added time, Rostov again pushed forward and won a free kick wide on the left side of the United penalty area, but the ball into the box went unchallenged after a Rostov foul. Man United will fancy their chances of heading through to the quarter-finals of the Europa League with a vital away goal, but Rostov are unlikely to go down without a fight. After the match, United manager Jose Mourinho emphasized the importance of the away result, as winning the Europa League would mean automatic qualification for the Champions League, something they look unlikely to achieve through the English Premier League. Next up for United is a trip to Premier League leaders Chelsea, and Rostov will play Terek Grozny before the second leg between the two at Old Trafford on March 16.